In the midst of the deep darkness of December, made complete with the Winter Solstice, is the promise that light follows. Advent, the prelude to Christmas, invites us to anticipate the embodiment of this light, in the life of a baby named Jesus. This can be hard to believe when the temperature is cold and the sun sets so early. Hard to believe as a metaphor of hope, when the political winds blow contrary to so much that I hold sacred and dear. With such dark thoughts in mid December, I climbed into my Subaru and headed 90 miles for Canterbury, New Hampshire. I’d heard about a little church that invites seekers to unplug, breathe deeply and walk mindfully in the forest. I drove up a snowy road to Church of the Woods http://kairosearth.org and parked adjacent to a small barn. Standing in a field, adding logs to a campfire, was Steve Blackmer, pastor of this unusual church. Steve, a forester by profession, has become an ordained Episcopal priest. His parish is the outdoors. Most often congregants are sent out into the woods, in silence, to commune with our Creator. Church of the Woods is tapping into a truth that most of us know but so often forget. That that great mystery we call God/Spirit/Creator, is heard and sensed most clearly when in nature. Early Christians had a name for this truth: ‘The Book of Nature’. They believed that in nature we hear and experience the voice of the Creator reminding us to be humble, thankful, mindful. Inviting us to make room for awe and wonder. Steve invited us to walk the snowy paths of Church in the Woods. We worshipers were a mix of ages from three to seventy plus. He invited us to listen carefully for little, holy words. 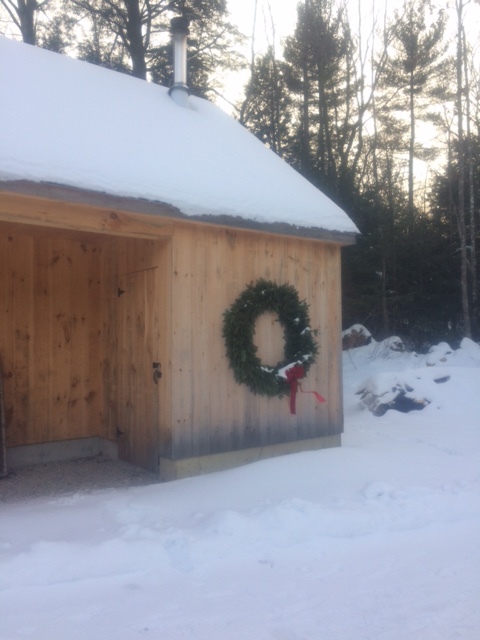 After a time of wandering, a bell called us back to the barn with its wood stove. There we warmed our bodies and shared gifts from our walk. 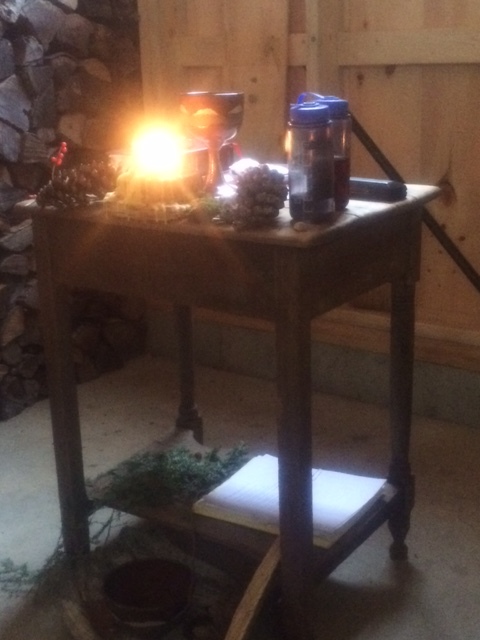 On the altar was the Eucharist, to which we added decorative touches of pine cones and hemlock bough. Steve spoke ancient words inviting us to consume the bread and drink from the cup. Each a symbol of God’s grace. Once all were served, Steve poured wine onto the ground, reminding us that the fertile soil is the source from which the wine and bread come and to which we will one day return. Now late in the afternoon, the sun had begun to set. It was time for me to drive home. I left feeling calm, centered and thankful. Thankful for the Book of Nature that had spoken so gently and clearly. Reminding us that ‘little words’ from God are being spoken for those with ears to hear and eyes to see. This season may we remember that light always follows darkness. I often used to feel my closest times to God were on a beach as I poured my heart out and when I was younger I asked desperatly for help. I haven’t been on a beach in a long time and reading this makes me think it’s time to go back. Ami, we are so fortunate to live close to the ocean. Hope 2018 is your year to savor time by the sea. HI Lisa, good to hear from you. I enjoyed going to your web site and seeing what you and Mark are up to. An intriguing and exciting ministry. Look forward to talking more. I’m very interested in the September contemplative paddle on the Blackstone River.